We wake up casting anxious looks at the sky after yesterday’s clouds – no actual rain seems to have fallen but we both feel pretty downcast at breakfast because of fears for the weather. The day outside looks distinctly damp. Things pick up after breakfast when we fall into conversation with the B and B landlord. His house is a funny mixture of minimalist chic and friendly clutter, as if they couldn’t quite live up to the ideal – but have a nicer home for it. There are lots of old children’s books and it is no surprise to find he is an ex-librarian and his partner was a primary school teacher. While Lisa is paying, Andy is being warned by the postman that buckets of rain are predicted. They discuss the merits of Post Office waterproofs past and present. Inside, Lisa and Mr H are deep in conversation – and Andy and Mrs H get drawn in. It roams across librarianship, the London Borough of Brent, teaching, walking and countryside politics. They have a ‘mad walkers’ story for us – a Hereford farming couple who dispensed with rucksacks and carried everything they needed in their pockets. This, like yesterday, highlights a big dilemma. We come on holiday and meet a lot of nice people with whom we seem to share a wavelength, but the path regime means time spent talking is time not available for walking. Still, we feel the talking is important too. Following Mr H’s directions, we rejoin the path at Gurnard’s Head. 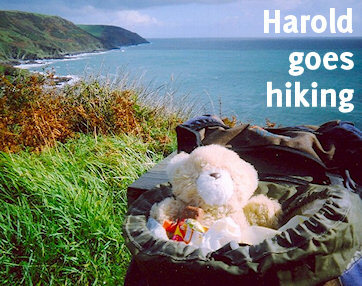 We have been warned that the path is tough as far as Pendeen Watch and easier afterwards and that some parts are deep mud which can swallow you up to the thighs – if you are lucky. The drop into Porthmeor Cove is not too bad but the climb out is horrible. The path is uneven and crossed by springs, creating mud patches where cows have wallowed – and more than mud, in places. Today is shaping up to be just as good as yesterday, in other words, except the path is far, far boggier as Mr H has warned. A short sharp shower early on is one of the most destructive things to happen as it gets us into waterproofs. The day never quite looks good enough to make us want to take these off again as it seems to be forever threatening more rain. This converts an already difficult stage into a self-generated steam bath. Bosigran Cliff is marked in the book with dire warnings about picking the right path, as others lead to sheer cliff faces. In fact, the correct path proves easy to find. This is climbers’ country and they are visible like small, multicoloured flies on the red rock face. It is possible they think we are as crazy as we think them – but not likely. Also making us question our sanity is the bloody great hole by the side of the path – an unmarked mine shaff. All you can really say about this stage is that it was difficult and horrible, although the scenery was great, especially around Porthmoina Cove. From Trevean Cliff onwards there was a longish but possibly slightly flatter slog along to Pendeen Watch punctuated – for the purposes of interest only, you understand – by the drop and climb at Portheras Cove. We get mobile phone reception back at last and are able to check on things at home. As we start the descent into Portheras Cove the path winds down the slope in two closely parallel tracks, one of grey gritty earth and one of brown. They are barely a foot apart and Andy is curious about the colour difference. Lisa suggests it’s down to the different levels of use and therefore different levels of erosion. We are now just about at Pendeen Watch, which we both have (for different reasons) earmarked as they day’s lunch stop. It is at this point that Andy has to break the unwelcome news to Lisa that the pub lunch she has been looking forward to will not happen: there are no pubs. (Mr H, apparently, mentioned two and recommended one of them, but there is no sign of them on either map or skyline.) Andy hopes for an obvious resting place to construct a packed lunch and maybe even break out the camping stove for the first time, but that too proves to be a vain hope. All there is at Pendeen Watch (apart of course from the lighthouse) is a lot of disused mine workings and a big house that looks from a distance like a pub but actually turns out to be nothing so useful. It’s just a house. The lighthouse is open to the public but we don’t care. We are tired, hungry, pissed off and, right now, frankly rather blasé about yet another bloody lighthouse. The SWCP Association guidebook suggests a precipitous alternative path immediately after Pendeen Watch to avoid what it considers to be an inferior inland stretch. We look at each other, give a hollow laugh, and take the easier offical route, inferior or not. We are influenced by the thought that ahead lies our last hope of a decent lunch and somewhere to get out of hellish waterproofs and dry off – Geevor tin mine. We have happy memories of it – will it live up to them this time? The waterproofs are the big issue with the insides of the things resembling a very hot sauna and something suspicious is happening at the level of Lisa’s knees where there are no less than four layers of fabric – support bandages, actual trousers, waterproof trousers and gaiters – and she is inspired by a desperate need to change into some different clothes, something currently totally impossible. This is very demoralising. Geevor feels like it might well provide a refuge – we’ve been before, it was friendly and nice, but it seems safest not to make assumptions. We turn our back on Pendeen (“The biggest village on the path since St Ives” says one book. Well now, that doesn’t mean very much, right?) and march on towards the amusingly-named Trewellard’s Bottom, which experience by now tells us will have something to do with mining. Geevor may no longer be a working mine, but there’s still a lot of it and Andy is fooled into trying to cut inland too early. The lack of a path to the very visible buildings only becomes apparent after an unwelcome climb. Although Geevor’s main buildings are inland, its diaspora extends down to the coast (and in fact under the sea bed) and soon we find ourselves in quite an amazing landscape of ore-red industrial archaeology, with ruined and half-dismantled buildings of all ages. We know the café has been expanded since our previous visit and we are hopeful. Our hopes are confirmed by a large hand-painted sign with the opening times on a wall by the path. The ascent is steep but boggling over the moonscape around us takes the edge off it. Into the visitor centre, some very welcome toilets, and the end of the waterproofs and therefore of the steam bath. How experienced a walker do you have to be before you learn to avoid these ridiculous situations? It is generally something you encounter at least once per walk. Back to the café, which currently contains a mildly anxious walking partner and a half-ordered meal. It is a very light, airy room with a view straight out to sea, wood floors and work by local artists around the walls. It is full of very quiet couples in fleeces drinking posh coffee and we feel like the floor show, even given the immense feeling of relief at having arrived at somewhere with toilets, food and chairs. We phone ahead to let the landlady of the next B and B know we are at least within hailing distance of her establishment and reluctantly, at closing time and after everyone else, we leave Geevor’s café and get on with it, picking our way back down the slope to the path. It’s definitely a bit drizzly by now but nothing is enticing us back into those waterproofs. Fed, watered and aired, we are now in a position to take much more notice of the local mining heritage despite the progressively worsening rain. Just above Geevor there is a nice surprise – Levant, one of the most famous of the engine houses, and the best example we’ve seen since Wheal Coates. A pity we are limited by the low light levels from taking many photos. This marks the start of a fascinating landscape which lasts most of the way to Cape Cornwall, starting at Geevor which, as we left it behind, looked like it had only stopped turning out the tin yesterday. We drift inland past disused chimneys, take an awful detour which takes us up a big rocky outcrop instead of into the village as we plan, and have a bit of trouble finding our accommodation where we are welcomed with a frank acknowledgement that we are wet. Still, it’s comfortable and we can get dinner in a local pub which is full to the seams with locals holding a darts match. We are treated with the utmost courtesy and are able to get a much better meal than we would have thought possible between here and Land’s End. Start: 11.10am; lunch: 4pm; end: 6pm; time on path: 6 hours 50 mins.